The 2013 Rhode Island Early Learning and Development Standards are intended to provide guidance to families, teachers, and administrators on what children should know and be able to do as they enter kindergarten. They are intended to be inclusive of all children - English language learners, children with special health care needs, children with disabilities, and children who are typically developing - recognizing that all children may meet the Early Learning and Development Standards. The standards were approved for use by the Rhode Island Board of Education on May 23, 2013. In 2004, parents, early childhood educators, and local experts worked with RIDE to develop the Fun Family Activities for Preschoolers, which encompassed Fun Family Activity Cards for Preschoolers, and later in 2004, a parent training series. Then, in 2013, with the release of new state Standards, called the Early Learning and Development Standards, the cards and trainings were updated to now include activities for children ages birth to 60 months. Fun Family Activity Cards give parents information and enjoyable ways to support the development and learning of young children at home. The activities are meant to help your child develop skills that are important for future learning and will further support a Standards-based education children may receive in early care and education settings. The training series titled Fun Family Activities is based on the knowledge that parents have a critical role in supporting children’s learning and development and preparing children for later school success. The content of the training builds upon information published within the Fun Family Activity cards and incorporated the latest research and best practice in both early childhood development and parenting. At the start of the training, each participant receives a packet of Fun Family Activity Cards and a treasure box to hold their initial set of activity cards. During subsequent sessions, participants focus on the nine domains addressed in the RI Early Learning and Development Standards. They learn about each domain, review relevant research that impacts their role as parents, and experience fun and creative ways to support their child’s learning in each area through home and community activities. commit to ongoing involvement in their child’s education. At the start of the training, each participant receives a packet of Fun Family Activities and a treasure box to hold their initial set of activity cards. During subsequent sessions, participants focus on the eight domains addressed in the RI Early Learning Standards. They learn about each domain, review relevant research that impacts their role as parents, and experience fun and creative ways to support their child’s learning in each area through home and community activities. Participants engage in a variety of activities utilizing materials and resources that are low cost and accessible. Participants are then encouraged to replicate the activities with their own child when they return home. Participants then spend time individualizing their treasure boxes by creating additional activity cards that represent their own child’s development, interests, and learning styles and reflect each family’s unique culture. RIDE has also developed a Parent Guide which includes information for families and caregivers on how they can use the Standards with their child, why Standards for children are important, what families should know about selecting a Standards-based early care and education program as well as resources for additional information. The Parent Guide is meant to serve as a brief guide which provides families the key information they should know about the Standards. The Standards represent expectations for young children’s learning and continual growth in all areas: intellectual, physical, and emotional. Research confirms that successful approaches to supporting early learning are based on knowledge of the whole child. As a result, the revised early learning and development standards feature one notable change from the 2003 standards: play is embedded throughout the learning document rather than being treated as a specific standard. Indicators establish the specific developmental benchmark for the competencies, behaviors, knowledge and skills that most children possess or exhibit at a particular age. Seen altogether, the indicators depict the progression of development over time. The emphasis in this domain is on physical health and motor development as an integral part of children’s overall well-being. The healthy development of young children is directly related to practicing healthy behaviors, strengthening large and small muscles, and developing strength and coordination. As their gross and fine motor skills develop, children experience new opportunities to explore and investigate the world around them. Conversely, physical health problems can impede a child’s development and are associated with poor outcomes. As such, physical development is critical for development and learning in all other domains. The components within this domain address health and safety practices, gross motor development, and fine motor development. Children with physical disabilities may demonstrate alternate ways of meeting gross and fine motor goals; for example, by pedaling an adaptive tricycle, navigating a wheelchair, or feeding themselves with a specialized spoon. Children with cognitive disabilities also meet these same goals in a different way, often at a different pace, with a different degree of accomplishment, and in a different order than typically developing children. When observing how children demonstrate what they know and can do, teachers must consider appropriate adaptations and modifications, as necessary. Principles of universal design for learning (UDL) offer the least restrictive and most inclusive approach to developing environments and curricula that best support the physical health and motor development of all children. Social and emotional development encompasses young children’s evolving capacity to form close and positive adult and peer relationships; to actively explore and act on the environment in the process of learning about the world around them; and to experience, regulate and express a full range of positive and negative emotions in socially and culturally appropriate ways. These skills, developed in early childhood, are essential for lifelong learning and success. A child’s temperament (traits that are biologically based and that remain consistent over time) plays a significant role in every child’s development and should be carefully considered when determining when and how a child should meet social and emotional learning goals. Healthy social and emotional development depends on consistent, positive interactions with educators and other familiar adults who appreciate each child’s individual temperament. This appreciation is central to promoting positive self-esteem, confidence, and trust in relationships. The components within this domain address children’s relationships with others- adults and other children- their sense of personal identity and self-confidence, and their ability to regulate emotions and behavior. Children with disabilities may demonstrate alternate ways of meeting social and emotional goals; for example, children with visual impairments may never make eye contact but rather demonstrate their interest in and need for human contact in other ways (through acute listening and touch); and children with cognitive disabilities may initiate play at a different pace and with a different degree of articulation and accomplishment. In general, the presence of a disability may cause a child to demonstrate alternate ways of meeting social and emotional goals. However, the goals for all children are the same, even though the path and the pace toward realizing the goals may be different. When observing how children respond in relationship, teachers must consider appropriate adaptations and modifications, as necessary. Principles of universal design for learning (UDL) offer the least restrictive and most inclusive approach to developing environments and curricula that best support the social and emotional development of all children. The development of children’s early language skills is critically important for their future academic success. Language development indicators reflect a child’s ability to understand increasingly complex language (receptive language skills), a child’s increasing proficiency when expressing ideas (expressive language skills), and a child’s growing understanding of and ability to follow appropriate social and conversational rules. The components within this domain address receptive and expressive language, pragmatics, and English language development specific dual language learners. As a growing number of children live in households where the primary spoken language is not English, this domain also addresses the language development of dual language learners. Unlike most of the other progressions in this document, however, specific age thresholds do not define the indicators for English language development (or for development in any other language). Children who become dual language learners are exposed to their second language for the first time at different ages. As a result, one child may start the process of developing second-language skills at birth and another child may start at four, making the age thresholds inappropriate. So instead of using age, The Standards use research-based stages to outline a child’s progress in English language development. It is important to note that there is no set time for how long it will take a given child to progress through these stages. Progress depends upon the unique characteristics of the child, his or her exposure to English in the home and other environments, the child’s motivation to learn English, and other factors. Children with disabilities may demonstrate alternate ways of meeting the goals of language development. If a child is deaf or hard of hearing, for example, that child may demonstrate progress through gestures, symbols, pictures, augmentative and alternative communication devices, and/or signs as well as through spoken words. Children with cognitive disabilities may also demonstrate alternate ways of meeting the same goals, often meeting them at a different pace, with a different degree of accomplishment, and in a different order than typically developing children. When observing how children demonstrate what they know and can do, the full spectrum of communication options—including the use of American Sign Language and other low- and high-technology augmentative/assistive communication systems—should be considered. However, the goals for all children are the same, even though the path and the pace toward realizing the goals may be different. Principles of universal design for learning (UDL) offer the least restrictive and most inclusive approach to developing environments and curricula that best support the language development of all children. Development in the domain of literacy serves as a foundation for reading and writing acquisition. The development of early literacy skills is critically important for children’s future academic and personal success. Yet children enter kindergarten varying considerably in these skills; and it is difficult for a child who starts behind to close the gap once he or she enters school (National Early Literacy Panel, 2008). The components within this domain address phonological awareness, alphabet knowledge, print awareness, text comprehension and interests, and emergent writing. As a growing number of children live in households where the primary spoken language is not English, this domain also addresses the literacy development of dual language learners. However, specific age thresholds do not define the indicators for literacy development in English, unlike most of the other developmental progressions. Children who become dual language learners are exposed to English (in this country) for the first time at different ages. As a result, one child may start the process of developing English literacy skills very early in life and another child not until age four, making the age thresholds inappropriate. So instead of using age, The Standards use research-based stages to outline a child’s progress in literacy development. It is important to note that there is no set time for how long it will take a given child to progress through these stages. Progress depends upon the unique characteristics of the child, his or her exposure to English in the home and other environments, the child’s motivation to learn English, and other factors. Children with disabilities may demonstrate alternate ways of meeting the goals of literacy development. For example, a child with a visual impairment will demonstrate a relationship to books and tactile experiences that is significantly different from that of children who can see. As well, children with a cognitive impairment may reach many of these same goals, but at a different pace, with a different degree of accomplishment, and in a different order than typically developing children. However, the goals for all children are the same, even though the path and the pace toward realizing the goals may be different. Principles of universal design for learning (UDL) offer the least restrictive and most inclusive approach to developing environments and curricula that best support the literacy development of all children. Development in the domain of cognition involves the process by which young children grow and change in their abilities to pay attention to and think about the world around them. Infants and young children rely on their senses and relationships with others; exploring objects and materials in different ways and interacting with adults both contribute to children’s cognitive development. Everyday experiences and interactions provide opportunities for young children to learn and solve problems, differentiate between familiar and unfamiliar people, attend to things they find interesting even when distractions are present, and understand how their actions affect others. Research in child development has highlighted specific aspects of cognitive development that are particularly relevant for success in school and beyond. These aspects fall under a set of cognitive skills called executive function like an “air traffic control system,” helping a child manage and respond to the vast body of the information and experiences he or she is exposed to daily. The components within this domain address logic and reasoning skills, memory and working memory, attention and inhibitory control, and cognitive flexibility. Children with disabilities may demonstrate alternate ways of meeting the goals of cognitive development. In particular, children with a cognitive impairment may reach many of these same goals, but at a different pace, with a different degree of accomplishment, and in a different order than typically developing children. However, the goals for all children are the same, even though the path and the pace toward realizing the goals may be different. Principles of universal design for learning (UDL) offer the least restrictive and most inclusive approach to developing environments and curricula that best support the cognitive development of all children. The development of mathematical knowledge and skills contributes to children’s ability to make sense of the world and to solve problems they encounter in their everyday lives. Knowledge of basic math concepts and the skill to use math operations to solve problems are fundamental aspects of school readiness and are predictive of later success in school and in life. The components within this domain address number sense and quantity; number relationships and operations; classification and patterning; measurement, comparison, and ordering; and geometry and spatial sense. Children with disabilities may demonstrate alternate ways of meeting the goals of mathematics development. In particular, children with cognitive impairments may reach many of these same goals, but at a different pace, with a different degree of accomplishment, and in a different order than typically developing children. However, the goals for all children are the same, even though the path and the pace toward realizing the goals may be different. Principles of universal design for learning (UDL) offer the least restrictive and most inclusive approach to developing environments and curricula that best serve the mathematics development of all children. Children are scientists from the moment they are born, using their senses to observe and gain knowledge about the world around them. As they grow older, they become increasingly more adept at using their observations to make predictions and to plan investigations in order to solve problems and answer questions. These skills are important aspects of school readiness as they provide a process for children to ask and answer their own questions by absorbing and making sense of information. The components within this domain addresses a child’s ability to use scientific methods- observing, planning for investigations, collecting and analyzing data, and communicating information- as well as indicators of a child’s content knowledge of the natural and physical world. Children with disabilities may demonstrate alternate ways of meeting the goals of science development. Children with visual impairments, for example, will explore and understand a flower in a way that is different from that of a child who can see; and children with a cognitive impairment may reach many of these same goals, but at a different pace, with a different degree of accomplishment, and in a different order than typically developing children. However, the goals for all children are the same, even though the path and the pace toward realizing the goals may be different. Principles of universal design for learning (UDL) offer the least restrictive and most inclusive approach to developing environments and curricula that best support the science development of all children. The area of social studies involves children’s ability to understand how they relate to their family and community, their understanding of social norms, and their ability to recognize and respect similarities and difference in people. In addition to helping children develop an understanding of time (past, present, and future) and place (geography), these skills are important because they also help children place themselves within a broader context of the world around them and to think beyond the walls of their home and early childhood classroom. The components within this domain address children’s understanding of self, family, and community as well as basic geography and a sense of past, present, and future. Children with disabilities may demonstrate alternate ways of meeting the goals of social studies development. In particular, children with a cognitive impairment may reach many of these same goals, but at a different pace, with a different degree of accomplishment, and in a different order than typically developing children. However, the goals for all children are the same, even though the path and the pace toward realizing the goals may be different. Principles of universal design for learning (UDL) offer the least restrictive and most inclusive approach to developing environments and curricula that best support the social studies development all children. The arts provide children with a vehicle and organizing framework to express ideas and feelings. 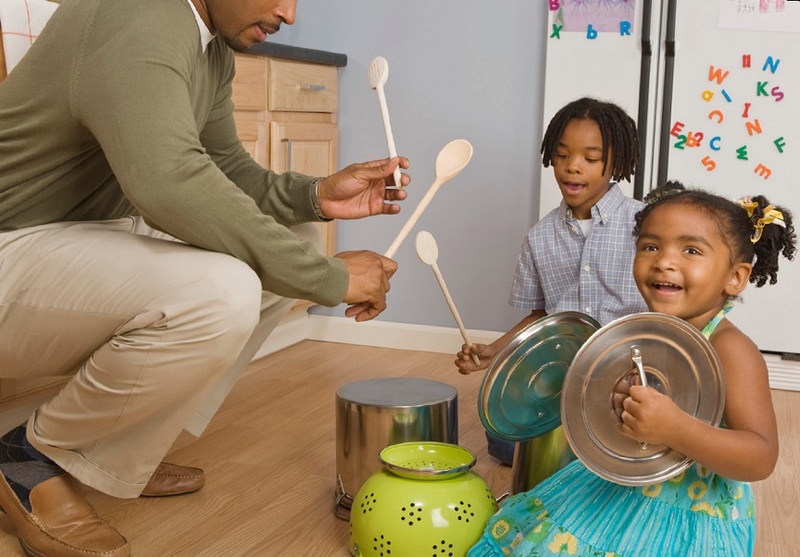 Music, movement, drama, and visual arts stimulate children to use words, manipulate tools and media, and solve problems in ways that simultaneously convey meaning and are aesthetically pleasing. As such, participation in the creative arts is an excellent way for young children to learn and use creative skills in other domains. The component within this domain addresses a child’s willingness to experiment with and participate in the creative arts. Children with disabilities may demonstrate alternate ways of meeting the goals of creative arts development. Children, who cannot speak, for example, will focus on activities that are rhythmic rather than vocal, and children with hearing impairments will be able to respond to music by feeling the vibrations in the air. Children with cognitive disabilities also may reach many of these same goals, but at a different pace, with a different degree of accomplishment, and in a different order than typically developing children. However, the goals for all children are the same, even though the path and the pace toward realizing the goals may be different. Principles of universal design for learning (UDL) offer the least restrictive and most inclusive approach to developing environments and curricula that best support participation in creative arts for all children.